Thank you to Seven Thirty Three, freshly pieced & Quilting by the River who are hosting linking parties. Each of their icons further down the page will direct you to their blog. Enjoy each of their blogs. They are each amazing with all kinds of creative things. I love visiting each of their blogs. 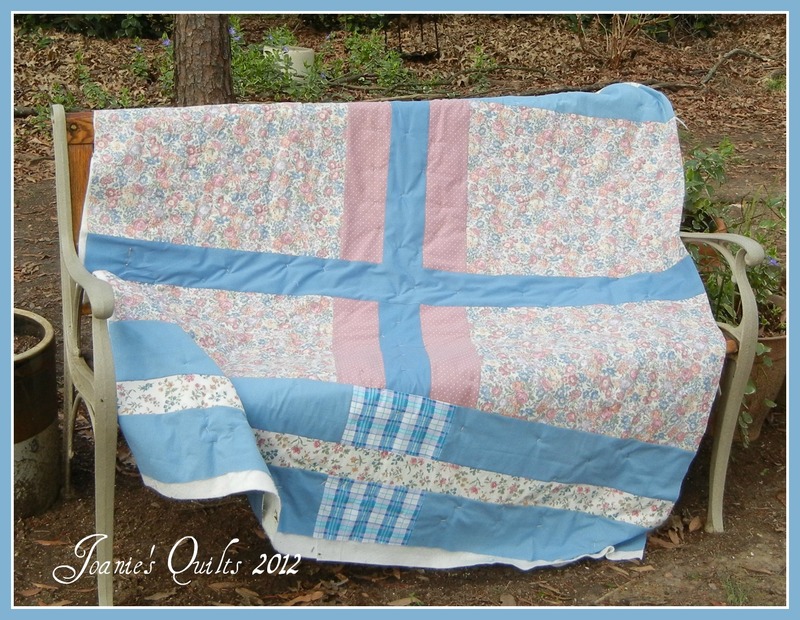 Oh my goodness - is it possible that some of the fabric in this quilt is from the 80s and 90s? Does this make me hoarder? 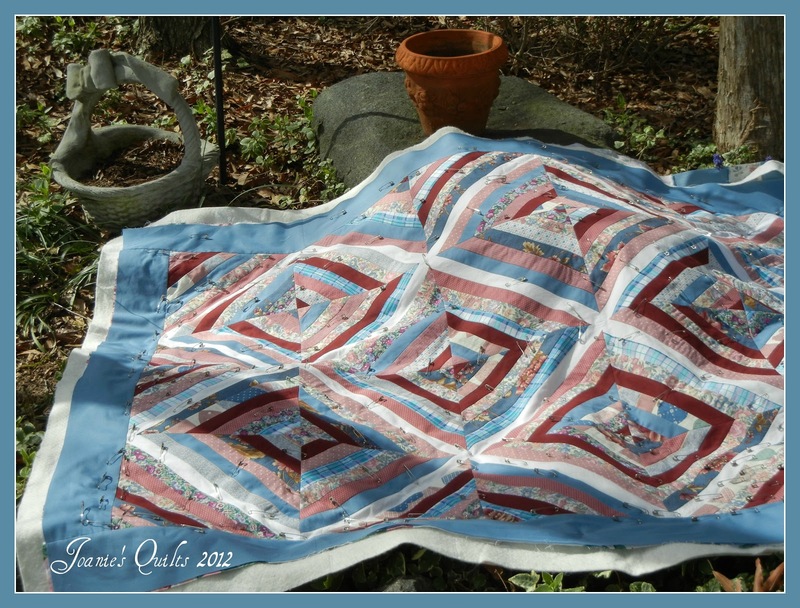 I once heard a gentleman spout that all quilters are hoarders! That makes me think about one of my husband's favorite TV shows American Pickers. Mike and Frank travel throughout the US looking for the best picks, usually from those who some call themselves collectors but many are really hoarders. Some of the places look like the city junk yard where Mike and Frank literally are climbing over the piles of stuff looking for their pot of gold. If climbing over stuff is an indication of being a hoarder I'm safe. No climbing to get to stash. And I can at least say I have done something to reduce the amount of old fabric in my stash. On the left is a picture of Mike, Frank and Danielle, the stars of American Pickers. Click on the photo for more information about the show. 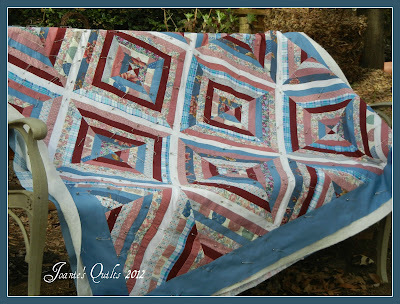 So do you like the scrappy string quilt made from 90s color fabric? I am quite pleased with how it turned out. It will make a nice charity quilt. For the back I used the leftover fabric from the top. It is safety pin basted ready for free motion quilting. I have been following Craftsy's Block of the Month, and ironically March's block is the same block pattern I used for my scrappy string quilt, the only difference is my 4 block units size to 20" x 20" where Craftsy's is 12" x 12." The batting is pieced too! I have a bin full of leftover batting and decided to sew together pieces of the same weight and fiber content. I used my walking foot and used a zigzag stitch to stitch the butted edges together after rotary cutting straight edges. Why didn't I think about zigzaging with the walking foot before? It was so easy and fast, faster than hand basting! Today is a beautiful Spring day that I had to take pictures of my quilt outside. And as always Cassie wants to join me so she can watch the birds, squirrels and whatever else that grabs her attention. The little fur ball is such a magnet for leaves. 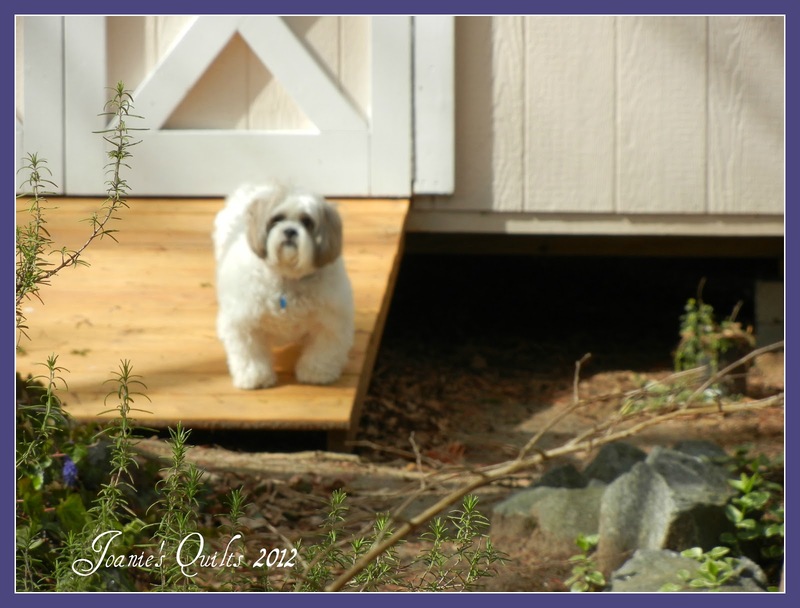 She leaves a trail of her collection in my house from downstairs to upstairs. I really wish she would leave her finds at the door before coming inside. For the new accounting jobs (2 missionary organizations) I acquired that I can do at home - love working at home! For the new wood flooring my hubby is getting me! - Cassie's trails will be less seen on it. For the sweet new friends at church I am making - The Women's Group changed their meeting day so I could attend since it conflicted with my meetings with the Charlotte Modern Quilt Guild. Congratulations on getting the jobs. It looks like you are going great guns with the scrap quilt. Love the picture of your dog, she looks like a love! Great string quilt. I love "the pickers"...they are a hoot. If you quilt, you can't be a hoarder as you are using your stash! Of course, I use the stash so I can buy more! that just makes me a fabric addict, I think. Praises for all your good news. Beautiful string quilt and the fabrics look so perfect!